He has hundreds if not thousands of frum descendant living in the United States and Canada. Where was Rabbi Bruder a Rav? I certainly can give you biographical information and some pictures. Do you happen to have a large book entitled The World That Was: America 1900-1945? It was published in 2004 and distributed by Mesorah Publications. In any event, it has a wealth of information and pictures on the development of Orthodoxy in America in those days and the individuals and families involved. There is a picture of Pinchus Bruder and his wife on page 343, together with their children, Moshe and Tzurtel Weberman, at the 1927 golden wedding anniversary of their children. This was just before he passed away.The article itself (from page 342 to 347) is primarily about Binyomin Wilhelm, who married the Weberman’s daughter (I.e. the Bruder’s grandaughter) and was a founder of Torah Vodaath. My great-grandmother was Mrs Weberman’s sister, Muti Fried. The Bruders came to America circa 1876 from Austro Hungary. Today, there are literally thousands of 5th, 6th and 7th generation American descendants including (among many others) the Belskys, Wilhelms, Webermans, Dickers, Jacobs, Hershkowitz, Bloom etc families. I myself am 5th generation and my grandchildren 7th. 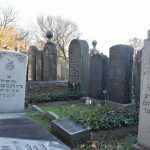 As a grandchild of R ‘ Pinchas Aaron I knew that he was a shoichet. My grandfather remembered him as a child and he was already an old man in his high 80 (he was 90 in 1927 when he passed away) and was no longer working at that time. Rabbi Weinberger was the rabbi in the cong. where Moshe Weberman who was son in law of R ‘ Pinchas Aaron was a member. It would appear that there was a dispute with Rabbi Dr. Hillel Klein about the Shochtim Union as Rabbi Weinberger who wrote two seforim Hoiel Moshe (p.1895) and Halacha Lmoshe (p.1902, see page 54) where you can find additional information. Both seforim are available on Hebrewbooks. TRYING TO FIND PAUL (PINKY) JACOBS FROM THE BRONX.CRESTON JHS. Hi. 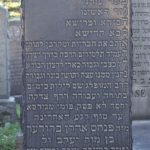 I hired a genealogist to do family research and just discovered our mutual ancestor, Rabbi Pinchos Aaron Bruder. 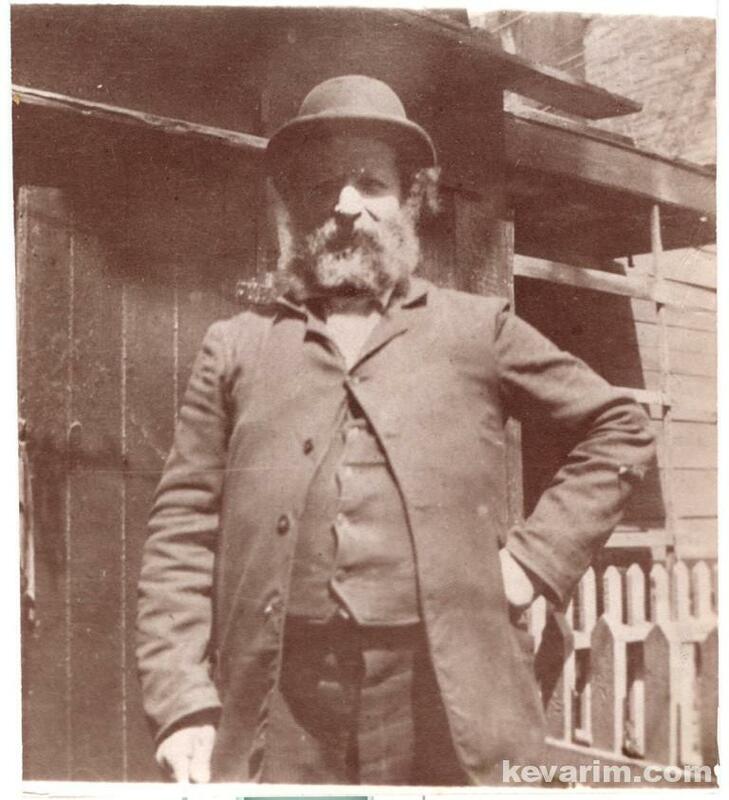 He was the father of my paternal great grandfather, Joseph Bruder. I spoke to my aunt, who never met him and told me that he had effectively disowned and sat shiva for my great grandfather because he decided to attend medical school and there were classes held on Shabbos. My great grandfather became a physician and practiced part of the time in Vienna and part of the time in New York and had two children, Muriel and Betty Bruder. Betty was my grandmother. I live in New York City and have a brother (who has three children) and two first cousins, one of whom lives in Brooklyn, the other in Berkeley, who are also descended from Rabbi Pinchos. I have two second cousins, one in New York and one in LA (Davidson is their last name) and their father lives in Rome. I would love to hear from any of my long lost relatives! I am Paul (Pinchas Aaron) Jacobs’ sister. Our Great Grandmother Anna Fried, whom we called Mutti was a daughter of Pinchas A. as was our Great Aunt Dora Bluestone, who lived into her late 90’s. I remember them both. My Grandmother Kate Jacobs had several siblings and raised an Orthodox family. Most of whom remain so to the seventh generation in America. Just saw your posts today. I live in Toronto, and know Tzvi Hershkowitz and Shragi Wilhelm here, who are Weberman descendants. I, myself, am a great, great grandson of the Bruders, but am descendant from another Bruder daughter, Anna Fried, a sister of Mrs. Weberman. (I am named after Pinchos Aharon Bruder!). Hella, I knew the Winston name growing up in Crown Heights. Usher, please send me information at paulaaronjacobs@rogers.com. My telephone number is (416) 633-6620. Could you please give us more biographical details of this great man who had such a wonderful zchus? Picture and article in this weeks’ Hamodia Mag. He was sent to America (to be a Shochet) by the Shiniever Rav z”l who blessed him to have good kids. A nice article, but תנא ושייר. Hello again. From census and other records I was able to find several addresses for Pinchos Aaron Bruder. I am another descendant. I am a great-great-grandson on Moshe Weberman>Kate Dicker>Shirley Fensterheim>Leah Lando (my mother). I would love to contact any relatives who are interested. Paul and Vivian, I am your mother Ruth’s first cousin. My father, Dr. Louis Fried, was your grandmother, Kate’s brother. My own brother is also named Pinchos Aaron, after the progenitor. Hella, your great grandfather, my uncle Joe, performed a tonsillectomy on me when I was 5 years old, at the now defunct Medical Arts Hospital on 57th Street in Manhattan. One of my father’s sisters, Celia, married a man named Izzie Winston. Are you related to him? Another descendant here, Moshe Balsam – Pinchas Aharon; Bracha Bruder; Tzurtel (Bruder); Moshe Weberman; Kate (Weberman); Mordechai Tzvi Dicker; Bluma (Dicker) and Josepn M. Balsam; Moshe Balsam; Rebecca (Langer). Anyone with further information on the Bruders please contact me via web admin. In memory of R’ Pinchas Aharon Bruder z”l, whose 84th yahrtzeit is today (26 Tamuz). I was wondering how I could go about looking for possible descendancy myself. My grandfather is Ray Bruder but he refuses to disclose anything about his family history. I’m a great-great grandaughter of Zaida Pinchas Aharon. My grandfather was Binyomin Wilhelm. I live in Israel and I’m presently gathering information about the Bruders, Webermans and Wilhelms. I have some info for those who want and am looking for more, if anyway feels qualified to share. Yes, Rabbi Pinchus Aharon Weberman of Miami was named after him. Which yeshiva did Rav Bruder teach in and where was it. Besides Tzurtel how many other children did he have. Also an Einekel. Ruth, to the best of my knowledge, he did not teach in any Yeshiva. It would seem that he had a t least the one son, ancestor of the Winston family, and one more daughter, ancestor of the Jacobs family. R’ Pinchos Aharon and Brucha Bruder were my great-great-great-grandparents (my mother’s (Brucha) mother’s (Ruth) mother’s (Kate Jacobs) mother’s (Chana [Mutti]) parents). One of our cousins was kind enough to provide me with a family tree. 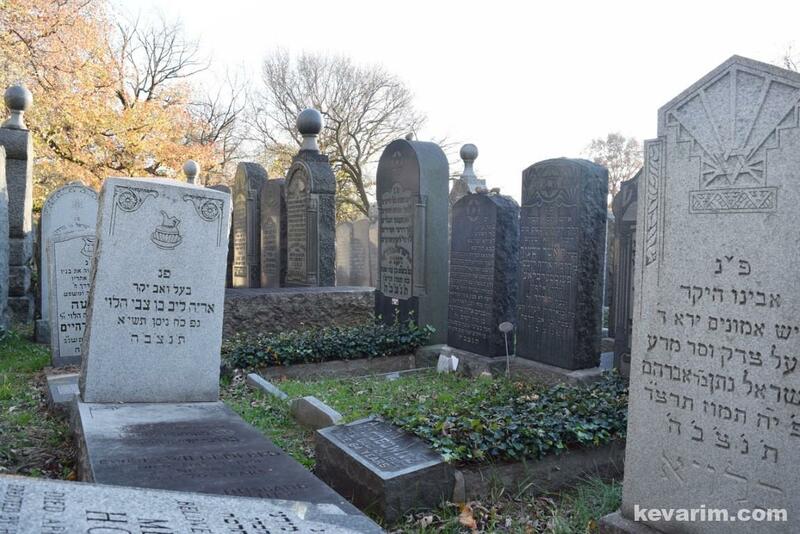 From the family tree it seems that R’ Pinchos Aharon and Brucha Bruder had seven (7) children. They were: Tzurtel (Weberman), Zalman, Joseph, Chana (Fried), Dora (Bluestone), Moshe, and Avraham. Since I don’t have all of their birthdates, I can’t be certain of the order in which they were born. One of the footnotes in the family tree states that R’ Pinchos Aharon’s father, R’ Yaakov, was a Dayan in Frankfurt-am-Main. The family moved to Bardejov (a.k.a. Bartfeld), Slovakia, in the 1830s, soon before R’ Pinchos Aharon was born. 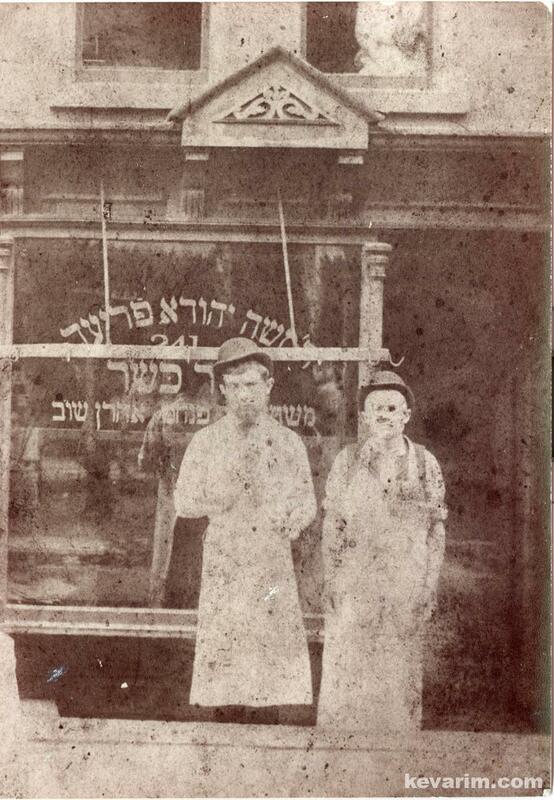 Besides being a Shochet, R’ Pinchos Aharon also oversaw the processing of (was Mashgiach on) dairy products in Hunter, N.Y. (I don’t know what years, but I think it was soon after the turn of the century.) I have a photograph of him with townspeople in Hunter, N.Y. This photo was given to my mother by Stella Jacobs (née Fried). 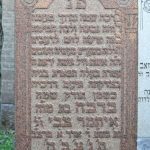 I was wondering if it would be possible to place a photo of Brucha Bruder’s matzeiva on this webpage. Here are some videos from the 89 Yortzeit of the Zeidy R’ Pinchas Aron Bruder. My mother was Rosemarie Jacobs her father was Harry Jacobs founder of Detecto Scales with his two brothers. 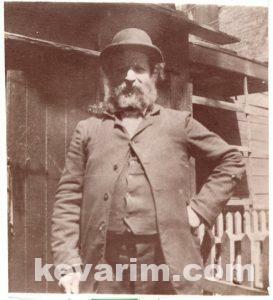 Harry was one of nine children born to Avram Levi Jacobowitz and his wife Racha a kosher butcher from Hungry. I’m trying to piece together my connection to Rav Bruder ? Maybe my long lost cousin Paul Jacobs can help me out ? My grandson Yoseph is the great grandson of Pinchas Aharon Fried who was born a few weeks after Pinchas Aharon BRUDER was niftar. Pinchas Aharon BRUDER Yarzheit is 26 Tamuz.Last year the Yated had an article about his 89 and said they planned a 90.Does anyone know when and where?